Lingerie is arguably one of the most complex categories of clothing. Very few other garments require quite the same level of accuracy, attention to detail, and skilled human labour. Understanding lingerie construction and quality can be a minefield, even if you have some sewing skills. 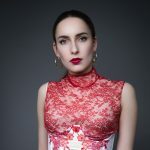 This series will cover some of the most common stitch and construction techniques used in contemporary lingerie, with the first part covering the most common stitches. This is by no means an exhaustive guide, but gives you the basic tools to decipher reviews and analyse garment quality in your own lingerie purchases. It's also crucial to remember there is a big difference in the construction techniques used by brands at different levels. Small, independent designers don't have access to the same machinery as large, corporate design houses. A bra produced by a mass manufactured label may use heavily industrialised techniques, like twin needle lockstitches and cover stitches - stitches an individual person who hand makes lingerie can only dream of. It doesn't mean one is necessarily better than the other. Part of learning about garment quality is the context and purpose of the garment. In a factory setting, each different stitch will require a separate industrial machine. These machines can be big financial investments, and often require a great deal of skill and training to operate at their best. Many of these stitches can also be found in smaller domestic sewing machines. Domestic sewing machines are often multi-purpose, offering many different stitch options. However, a domestic machine will often not stitch as accurately or quickly as its industrial counterparts. Not all lingerie has to be stitched together. Latex lingerie is usually glued or molded. Dress by Elissa Poppy, photo by K Laskowska. It's also worth noting not all lingerie has to be sewn together! It can also be molded or glued, depending on the fabric. This guide focuses purely on sewing techniques. This is the most common type of stitch in clothing. It’s used on almost every kind of garment you can imagine! It’s the most basic straight stitch with an - - - appearance. It can be used for everything from seaming and hemming to decorative stitch details. Inappropriate uses of a lockstitch would include being used on a stretch fabric in a seam under tension or as the sole stitch used to attach elastic. Too much tension can easily break and unravel a lockstitch thread. It's not ideal to seal elastic strap raw edges with a lockstitch either because this can result in the thread breaking or the elastic fraying. This is the same type of stitch as a standard lockstitch, but with two rows stitched consecutively. The sewing machine that creates this stitch has two bobbins and two needles. The width between the needles can vary, but this stitch is typically used to apply non-stretch tapes and casings, such as underwire channels, seam tapes and bone channels. Overlockers (also known as sergers in America) give a ‘finished’ edge to fabric that prevents fraying. It’s generally considered a quick and cost effective finish for garment seams, and can be crucial for stretch fabrics as the stitch itself is able to stretch without the threads breaking. Overlocker machines can have varying amounts of threads and widths. It is popular to use a ‘wooly’ yarn for some of the machine threads to give a more professional looking finish. Although this is generally considered a cheaper method of construction, you can still find this stitch in higher end lingerie; often a narrower stitch width is used then. 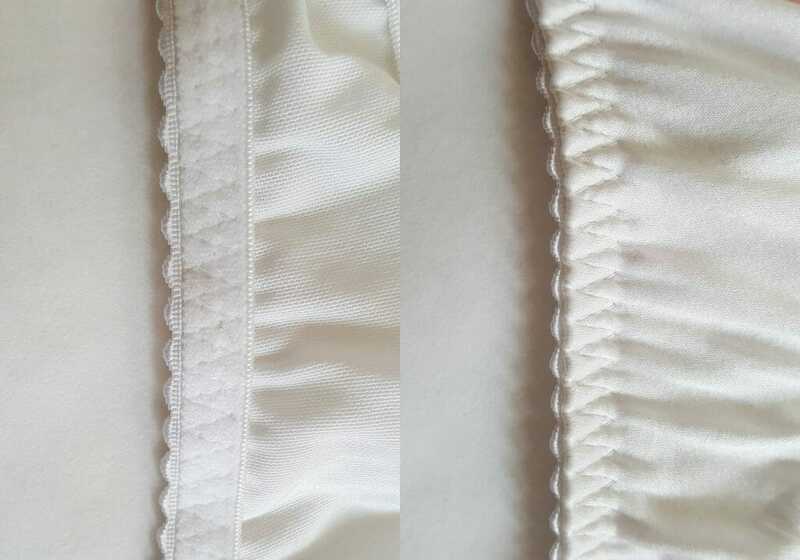 The leg edges on these Carine Gilson knickers are finished with a fine babylock stitch. 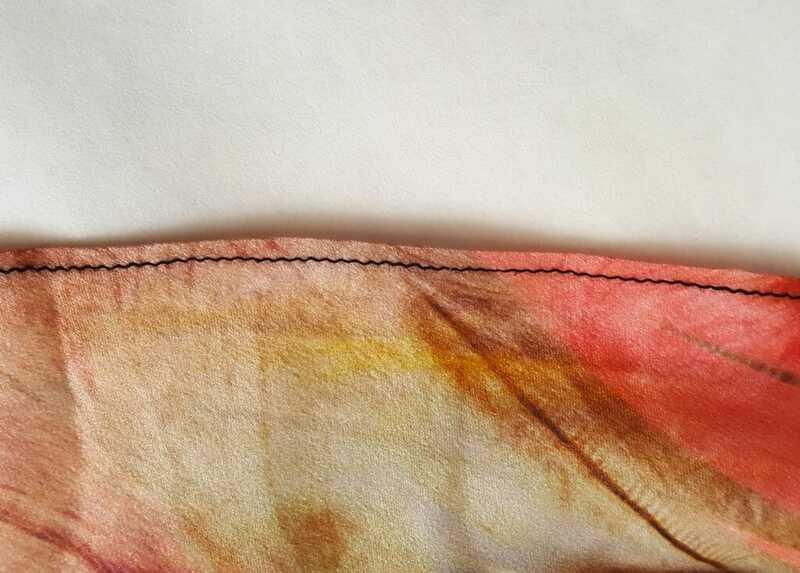 This stitch is most effective on particularly fine fabrics like this lightweight silk. A babylock stitch is essentially an overlock stitch with an incredibly narrow finish. It’s most commonly used for hemming lightweight fabrics and gives a ‘fluted’ finish to hems. You’ll most commonly find it in garments like floaty tap pants. 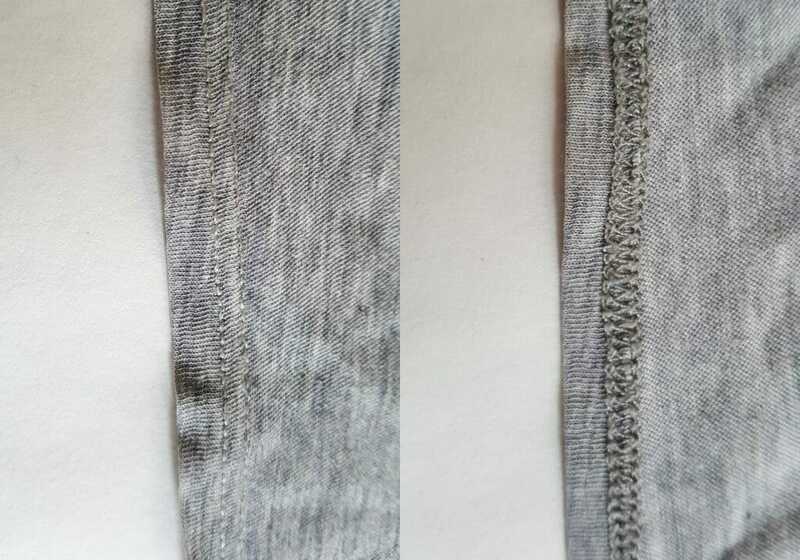 This stitch usually appears as a twin needle lockstitch on the garment exterior, with the interior similar in appearance to an overlock with ‘wooly’ threads used. It allows a garment to stretch and is commonly used on garment hems as it’s quick to apply and prevents the fabric from fraying. 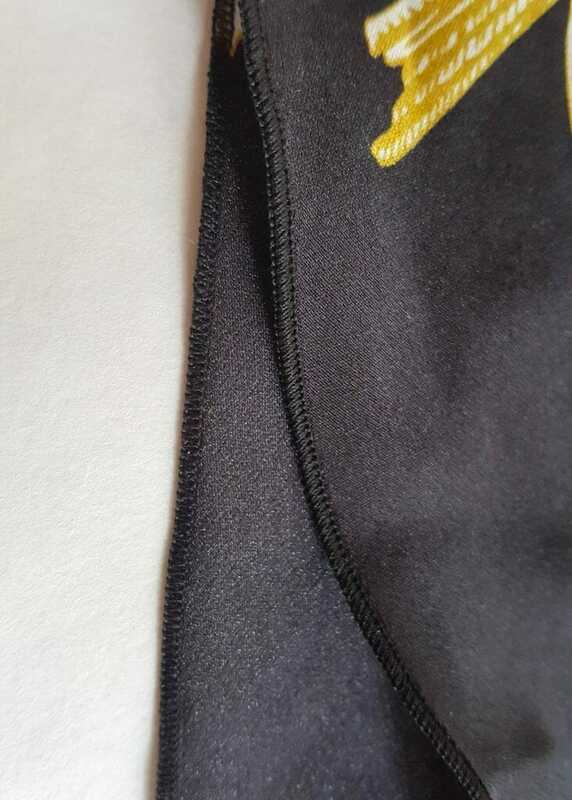 It can also be used to join seams (usually in athletic wear) and to apply elastic trims such as foldover elastic (a type of elastic tape that encases the raw fabric edge). This stitch looks how it sounds and has a number of uses. The appearance is typically /\/\/\. Its main benefit is it allows fabric to stretch without breaking the threads. It can also be relatively effective at preventing a fabric raw edge from fraying further. It is most commonly used to apply elastic trims and to apply appliqué. 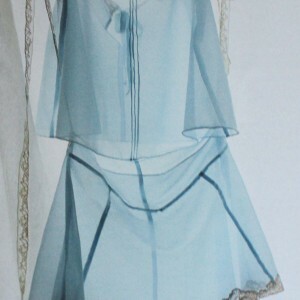 Higher quality garments have much shorter and narrower stitches. Longer zigzag stitches can be at risk of catching and breaking. 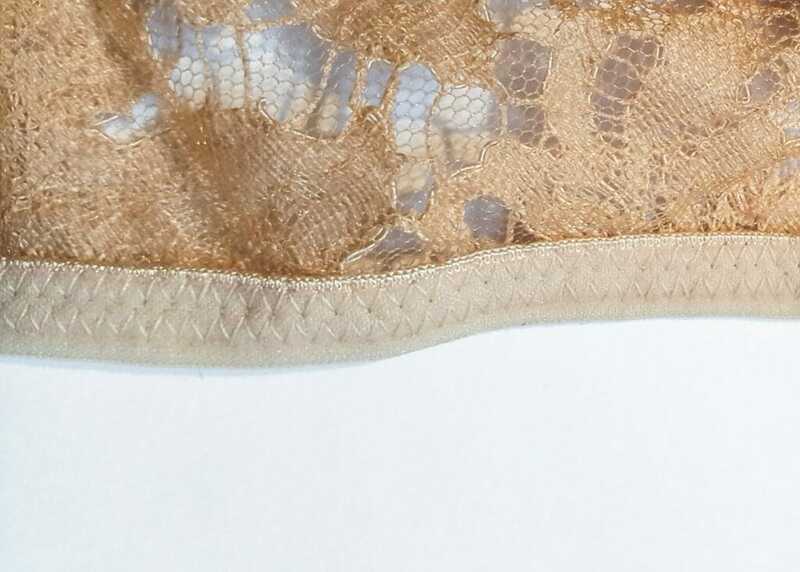 Some of the most luxurious brands on the market apply their lace appliqué using zigzag stitches so small you can barely see them. This gives the effect of the lace being ‘painted’ on. Zigzag stitches can also be used to join together foam panels in padded cut-and-sew bras. These seams are then often taped over so this stitch they won’t commonly be seen. This is a zigzag where each individual stitch is split into three. It’s used most commonly to apply elastic tapes to lingerie. Three point zigzag stitches can be applied wider than a standard zigzag without risking the threads catching or breaking, as the increased number of individual stitches make it a little more secure. The bartack stitch is typically used to seal underwire casings, bone channels and raw elastic edges. It has the appearance of an incredibly tight zigzag stitch and is one of the most secure stitches available. In bras where underwires have burst through the casing, you may notice they have worn through the fabric rather than broken this stitch. The bartack stitch is used relatively sparingly as it’s time consuming and needs specialist equipment and training to apply. You’ll generally only find the bartack stitching on lingerie made in a factory. Many indie designers replicate it with a very tight, standard zigzag stitch. This stitch is one of the reasons well-made 'strappy' lingerie can seem so expensive; this stitch can make these garments time consuming (and therefore expensive) to sew, but also makes them higher quality and less likely to unravel. There are still a number of other stitches used in lingerie, but this guide covers some of the most common. Future installments in this guide will include stitch quality, linings, seams and hems. This is a fascinating article and I can’t wait for the rest of it. When you say bartack is time consuming to apply, what might that mean in terms of minutes? I have no knowledge in this area, so I was wondering if sealing the underwires of a bra with bartack takes an extra minute or ten. If we’re talking any kind of production sewing terms (rather than a homemade project), any stitch operation is a matter of seconds rather than minutes, and the number of seconds is going to vary greatly depending on the size of the run, the experience of the stitcher, the machine speed etc… But the bartack in particular is a difficult and dangerous machine (only people with special training will ever be allowed to use it), and it will take longer to sew a single underwire sealing stitch than, say, the entire underwire seam of a cup. It takes longer to line up the stitch, handle and complete the operation. For reference, some of my bra designs have a ‘wing’ made up of 6 adjustable straps. Each adjustable strap and the seam they went into needed to be bartacked to seal them… And that detail alone nearly *doubled* the production stitching costs compared to a ‘normal’ bra design. Any garment that takes more than a few minutes on a production line is going to become incredibly costly (bearing in mind that production lines are designed to cut down on manufacturing time by removing the ‘breaks’ between each stitch operation). So even an extra 15 seconds for a single stitch detail will multiply quickly… Which in turn will multiply the price. This is incredibly informative! I hope you continue this series. Thank you Katie! I already have another three installments lined up this series, and will hopefully come up with more further down the line. There’s entirely too much to say about how lingerie is made!